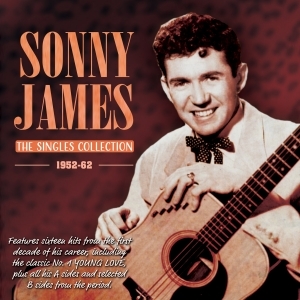 Known as “The Southern Gentleman”, Sonny James was one of the most popular and successful country artists of them all during the decades following WWII, racking up more than 75 hits in a chart career that lasted three decades through to 1983. He scored no less than 23 US country No. 1s, beginning with the landmark success of “Young Love”, which also topped the US pop chart, and including an extraordinary run of big hits in late ‘60s and early ‘70s beyond the scope of this collection. He was one of the first country artists to embrace the influence of rock ‘n’ roll, helping to give his work a more contemporary flavour than many of his Nashville peers, and was one of the new breed of country stylist who brought the genre into the modern era. This great value 62-track collection comprises a substantial proportion of the A and B sides of the forty or so singles he released on Capitol, NRC, RCA and Dot during the first decade or so of his career, with at least one side of most releases included, and naturally features all his country and pop chart entries from that era, including, as well as “Young Love”, the Top 10 country hits “That's Me Without You”, “For Rent”, “You're The Reason I'm In Love”, “First Date, First Kiss, First Love” and “Uh-Huh-mm”. Best-known as he is for his later work, this provides an enlightening and entertaining scene-setter for his later career, as his style develops from his country roots towards the new sound that would characterise Nashville in subsequent years.